Like a circle in a circle, like a wheel within a wheel, PubhD returns to The Vat and Fiddle. Three researchers get 10 minutes to explain their research with just a marker and a whiteboard. Then the audience gets to quiz them for 20 minutes. And they think their viva will be tough. 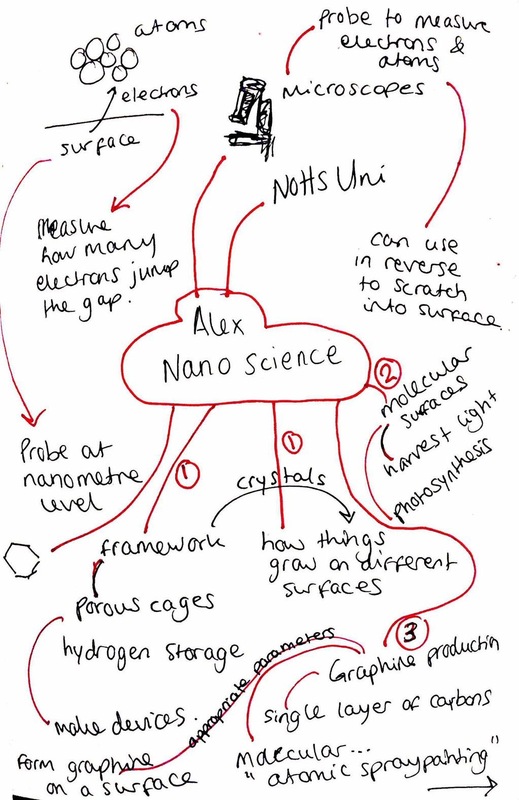 First up is Alex whose field of research is nano-technology. “Nano” of course meaning really small and “technology” meaning technology. He begins by talking about the special type of microscopes that he has to use. Normal microscopes use photons but you can’t use these on a really small scale. Fortunately, in the 1980s, IBM developed the scanning tunnelling microscope which uses a quantum tunnelling effect to be able to see things down at the atomic scale. There is also an atomic force microscope. These measure force but can be run in reverse to scratch surfaces. 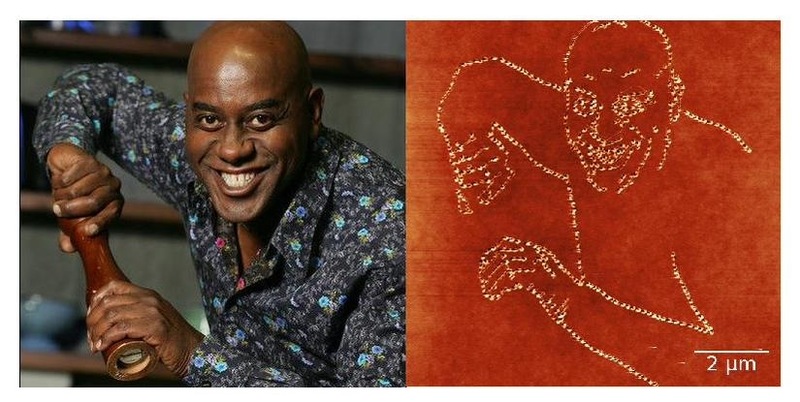 So, the image above of Ainsley Harriot was scratched into polystyrene in around 20 minutes. When not making images of former Ready, Steady, Cook hosts, Alex is using these microscopes to look at how crystals grow on different surfaces. Specifically, looking at how we can grow them to make flat, uniform surfaces. For example making nano-rings – individual molecules that harvest light and work in photosynthesis that could be used in making solar cells. He is also looking at graphene production and specifically trying to make it using “atomic spray painting” by bombarding sapphire with carbon to form single layers of carbon. This produces a very clean material but can the technique be made commercially viable? Is it possible to create a high enough purity over a large enough area with a high level of uniformity? Next up is Lucy who is researching Receipt Books. These were like an early version of recipe books. A receipt was a shared recipe and a receipt book compiled these recipes together. Lucy is looking into what these books can tell us about the 18th century and why people spent so long putting them together. Examining examples from Nottinghamshire and Derbyshire, we can see the history of what people ate. The time that Lucy is researching is a time where literary levels are beginning to increase but reading and writing is still mainly a preserve of the privileged. It was also a time of dichotomy between the old and the new. Old ideas like fleaing the fowl and hair sieves can be seen but so can the influence of Empire and the Continent in recipes such as pepper curry, pilau rice and kebabs. But why were elite women cooking at all? Well, ingredients such as spices were so expensive that they couldn’t trust the cooks with them. As well as food recipes, these receipt books also contained some unique medicine and healthcare ideas. For example, dealing with toothache by driving a nail into your gum and then driving it into a cork. Apparently a nosebleed could be dealt with by shoving moss up your nose. At this time we start seeing a distinction between food and medicine where previously there wasn’t one. The authors would liaise with doctors and midwives to share knowledge. There is still a fixation on the local in the receipt books. 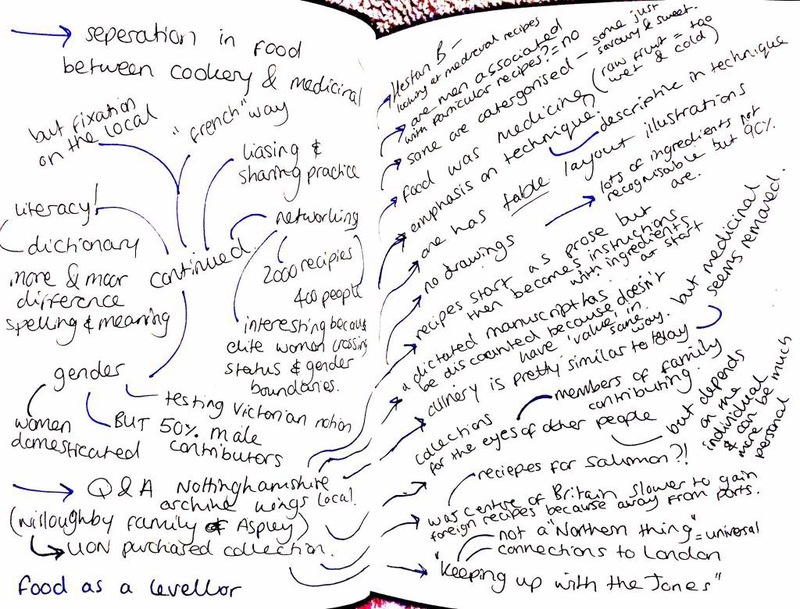 For example recipes like Derbyshire Pudding and a sore neck being referred to as “Derbyshire Throat” However, extensive networking is clear; Lucy has seen over 2000 recipes from over 400 people in 6 manuscripts. These authors crossed both gender and status boundaries. In fact as many as 50% of the recipes can be attributed to men. The Countess of Oxford had a receipt book that was very much a presentation copy. Other books could be more ad hoc and not necessarily for sharing outside of the family. The receipts themselves were often just scraps of paper that would be used in the kitchen whereas the actual books could be heirlooms or prized possessions. Originally the recipes would be stated as prose. As time goes on they become more segmented and similar to modern day recipe books with ingredients/method/serving suggestion. The one thing that difficult to tell is how valuable were these recipes? Would people really just give away their best ones? Key learning: There are a surprisingly high number of recipes for salmon in books from the land-locked Midlands. Finally we have Angelica, researching game transfer theory. These days we play a lot and we see things differently from previous generations. This has led some people to ask, “am I still playing a game when I put down the controller and go outside?” This is game transfer theory and people have reported hearing music from games, seeing images, moving objects and even involuntary actions. 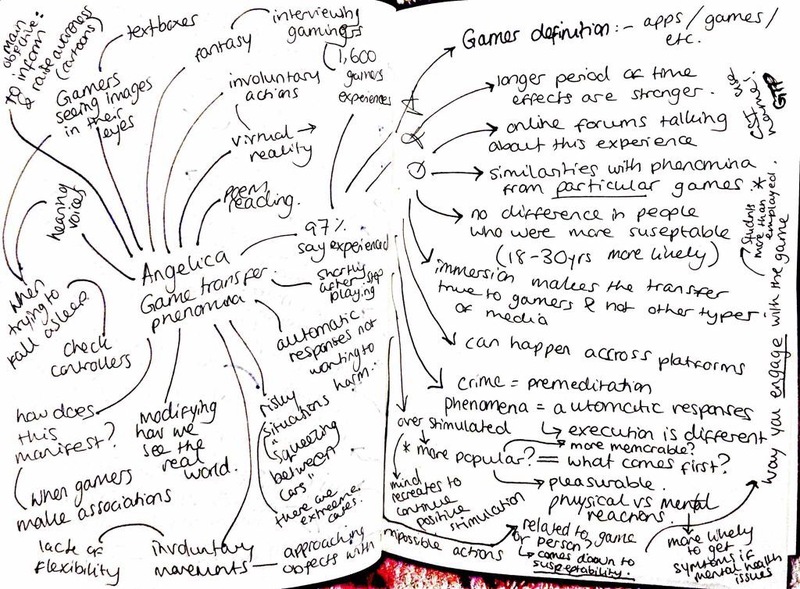 People can also have fantasies about games and have talked about visualising images from games. For example, seeing images when they close their eyes or seeing text boxes and health bars in real life. Up to 97% of gamers say that they have experienced some manifestation of game transfer phenomenon. In some instances, it is similar to having an “earworm”; where you hear a particularly catchy song and can’t get it out of your head. Some games have said that they have heard things when they are getting ready for bed and have had to go downstairs to make sure that their console is actually switched off. These phenomena will often have similarities with objects or experiences that they’ve seen in the games. For example a gamer who sees a car flipped over may think that it will explode because that’s what happens in the game. People will also try to interact with objects in real life the same way that they would do in a game. Sometimes there is a lack of flexibility between what people experience in games and in real life. Fans of first person shooting games talk of often moving in lots of sidesteps. Then there was a gamer who broke an object in a store because he thought that he would collect points for doing so. None of these actions are malicious in any way, they are all just automatic responses. Fans of Tetris have reported dreaming about falling blocks. While something similar could be an issue for somebody with a repetitive job, it’s more likely to happen to a gamer due to the emotional response/connection with a game. In terms of who experiences game transfer phenomenon, it can effect people of any gender and of any age, although it is more prevalent in the young. It all comes down to individual susceptibility. It also seems that these things are more likely to be experienced by gamers rather than fans of books, music or film because games are a more interactive and immersive medium. Key learning: The phrase, “game transfer theory” was invented by Angelica and has since gone on to be used in hit US TV series CSI (Crime Scene Investigation): Cyber. Special thanks this month to Alice Thickett, whose pictures are far better representation of the evening than my stuffy prose. PubhD returns to The Vat & Fiddle on the 22nd of July at 7:30 pm with talks on microbiology, history and architecture.